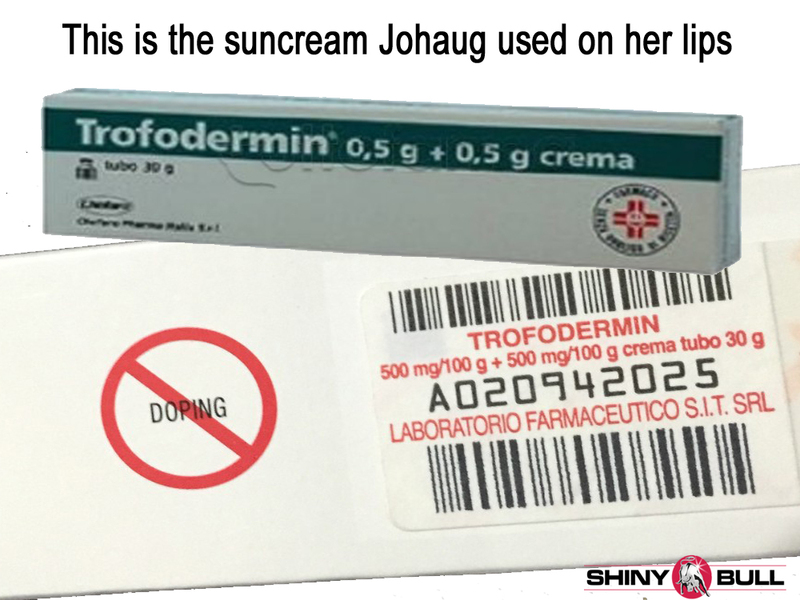 Last year, the Norwegian cross-country skier Therese Johaug tested positive for banned substance called Clostebol which is contained in the sunburn cream called Trofodermin. The Court of Arbitration for Sport (CAS) extended a ban imposed on the Norwegian skier on tuesday. The ban came out yesterday, and it is extended from 13 to 18 months. Doctor Bendiksen said Johaug took 3,5 gram out of 30 gram of Trofodermin and non of them saw the doping brand on the other side of the package. That sound a little bit strange, but if it was a box of pills, this case would have been very different. A pill is something you put inside your body but a suncream is something you put outside of your body. That`s probably why they were both “sleeping”. Who is thinking that a suncream can be harmful for the body? What would you do in this case? Would you scrutinize the package before you took the suncreem on your lips? No, I don`t think so. In other words; we are talking about “bona fide”. Johaug is one of the best. She won gold in the 4 x 5 km relay at the 2010 Winter Olympics in Vancouver. She won her first individual gold medal in the 30 km mass start race at the 2011 World Championships in Oslo. At the 2013 World Championships she won her second individual gold medal in the 10 km freestyle race. At the 2014 Winter Olympics in Sochi, she won the silver medal in the 30 km mass start. Another winner is Norway`s Martin Johnsrud Sundby who has been stripped of his 2015 Tour de Ski and 2014/2015 overall World Cup titles after the CAS upheld an appeal by the World Anti-Doping Agency (WADA) against him and the International Ski Federation (FIS). The three-time overall World Cup champion was penalized for twice exceeding the amount of Sulbutamol, also known as albuterol and a «standard therapy against asthma symptoms.» Based on WADA rules, the maximum amount that is allowed to be inhaled is 1600 micrograms over 24 hours. Sundby axceeded those limits on December 13, 2014 in Davos, Switzerland and January 8, 2015 in Toblach, Italy. Samples was analyzed by WADA. “While the medication is normally applied by a handheld metric dose inhaler (MDI), the athlete used a nebulizer to administer the prescribed salbutamol for the treatment of his asthma, which requires a higher labelled dosage than the MDI and thereby exceeded the allowed maximum dose,” FIS stated in its press release. Therefore, the athlete had a higher dose because of the need to use a nebulizer which requires a Therapeutic Use Exemption (TUE). When the tests were conducted in December 2014 and January 2015, the athlete was not in possession of a TUE and therefore found guilty of an anti-doping rule violation. We need to use the term “bona fide” in this case too. WADA appealed the FIS Doping Panels decision, made Sept 4, 2015, which defended Sundby. The CAS upheld WADAs appeal and, effective July 11, 2016, sanctioned Sundby for two months. In both cases, there are doctors involved and in both cases you can clearly see that the doctors is nothing you can rely on. Another winner is Lance Armstrong. An American former professional road racing cyclist. He is the 1993 professional world champion, and won the Tour de France a record seven consecutive times from 1999 to 2005. In 2012, he was banned from sanctioned olympic sports for life as a result of long-term doping offenses. As part of those sanctions, all results going back to August 1998, including his seven Tour wins, were voided. A United States Anti-Doping Agency investigation concluded that Armstrong had used performance-enhancing drugs over the course of his career and named him as the ringleader of «the most sophisticated, professionalized and successful doping program that sport has ever seen. Lance Armstrong chose not to contest the charges, citing the potential toll on his family. He has declined to testify about the full extent of his use of the drugs. Armstrong`s great-grandfather was the son of Norwegian immigrants. He started his sporting career as a swimmer at the City of Plano Swim Club. He won the Iron Kids triathlon at the age of 13. He was ranked number one triathlete in the 19-and-under group in 1987-1988. He is the 1993 World Champion. There is no doubt; Armstrong is a winner without any drugs and it started very early. Just like Usain Bolt. For me, it is very interesting to see that Lance Armstrong had a resting heart rate of 32-34 beats per minute (bpm) with a maximum heart rate of 201 bpm. This is exactly what I had in my latest test in the 90`s. So I know who I am. I know very well how it is to have that heart rate, so my question is: was it necessary with all this drugs? I dont know how much better you are with all this kind of drugs, but wouldnt Armstrong win without it? You cant take a pill and think you can win Tour de France. Its not that easy. We have seen people with drugs coming in far away from top three. World Champion Chess player Magnus Carlson is not the best chess player because he take some drugs. You still have to exercise, be strong and smart. And you have to exercise in many, many, many years. Many of the winners started as kids. I started as a football player in Rosenborg FC when I was 8 years old. Later on the same year I started to play ice hockey. Further on, I got my first racer bicycle from my mother when I was 12. I went on a ride the same day and my mother was shocked when I told her that I have been on a 70 kilometer (43,5 miles) long ride. Look at Usain Bolt. Also he started very early. He said; «When I was young, I didnt really think about anything other than sports», and by the age of 12, he became the schools fastest runner over the 100 metres distance. He is an eight-time Olympic gold medalist and the first person to hold both the 100 meters and 200 meters world records since fully automatic time became mandatory. He also holds the world record as a part of the 4 x 100 metres rely. He is the reigning Olympic champion in these three events. Because of his dominance and achievements in sprint competition, he is widely considered to be the greatest sprinter of all time. What`s wrong with that? We all know there is a black problem in the U.S, but so far, I havent heard something negative about Usain Bolt. It was different 80 years ago, and that takes me back to Hitlers Germany and a moment that stands above others: Jesse Owen`s performane at the 1936 Berlin Olympics. A black man destroyed the theory of Aryan physical supremacy by winning four gold medals. The Fuhrer was so horrified by Owenss trumph, he stormed from the Olympic stadium and didnt shake Owen`s hand, as he did with every other medalist. President Franklin Roosevelt never congratulated Owens or invited him to the White House either. Owens was also witness to the U.S Olympic team`s decision to replace two Jews on its relay squad with two African-American runners. The Americans were accused of acquiescing to Nazi demands not to humiliate them by letting Jews beat them as well as blacks. After the Olympic Games, Owens was forced to declare bankruptcy and no one was offering him a job. Later on he briefly toured with a twelve-piece jazz band under contract with Consolidated Artists, but found it unfulfilling. By the time he died, Owens was financially comfortable. Presidents and governments in America and beyond were competing to honour him as a symbol of athletic wonder and of opposition to fascism. Chris Froome won the Tour de France for the 4th time this year and he is the second in the list of most Tour titles. Jacques Anquetil, Eddy Merckx, Bernard Hinalt and Miguel Indurain have all five wins. Lance Armstrong has seven, so Chris Froome can take more gold in the tour in the years to come. Some people have to realize that some people are better than others. Its about DNA. Your DNA is not the same as mine. So? Im a talented cyclist but I could never win a fight against Mike Tyson. I simply don`t have the skills. But I would have crushed Tyson in cycling. We are all talented people and your skills is a gift to you from God. Your job is to find it. We are all born winners but have different skills.